The 1957 Indian Trailblazer for sale is a complete roller that has been set up like a board track racer. This rare bike has an updated front and rear end. 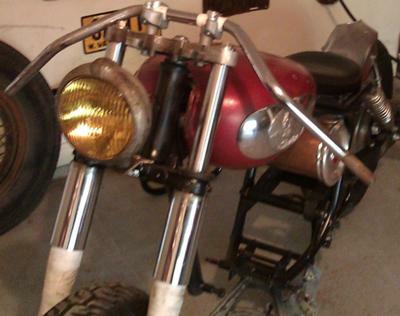 The originals are complete and do come with the bike including the motorcycle's rims, rear brake set up and so on. I will include a lot of extra parts including cables and such. The front and rear of the board track racing motorcycle needs to be fully restored but it has good tires and is set up with rear brake only. The 1957 trailblazer is complete but will need a the motor. The engine will not come in the sale but I can get my hands on one for an additional 500 dollars. The old Indian motorcycle for sale is located in Martinsburg West Virginia WV and please feel free to contact me with questions or to make offers using the space below that has been provided by GoGoCycles Used Motorcycles for Sale (and PLEASE do not neglect to include your contact information in your email or to provide a phone number or email address!) so that I can respond with answers to your questions or after consideration of your best offer as quickly as possible. In my opinion there is not a nicer 1957 Indian motorcycle for sale in WV West Virginia, on Craigslist or in an Ebay auction so hurry and make an offer before it gets away from you! The 1957 INDIAN TRAILBLAZER is a fine vintage motorcycle with many positive features . I am considering parting with my 57. Need to raise some cash. Making it into a bobber. Not altering anything that will prevent it from being restored to factory original. Replaced many mechanical parts. Rear hub completely replaced everything with new including tire.700 cc super meteor engine cleaned up, gaskets, o-rings, bolts, plugs all brand new. Converted to 12 volt. Still have some new parts to go on. All the high dollar items have been purchased and installed. To date I have about $7000 invested, asking $5000 or best reasonable offer. kag0512@hotmail.com. You can buy most of the parts new but can't find these bikes for sale. I realize if I sell this one, I will never find another. Won't budge much on the price. I see this bike is sold but I want a trailblazer and have cash. I am in Arizona and willing to travel to pick it up if we make a deal. lstgermain at gmail dot com. Hey is this still available? Im not too far from you and would like to look at it. I am interested. Please contact me. Thank you. Could you please post your asking price so that I can estimate how much I would have in the motorcycle after getting it ready for racing?